Ecuador may be best known as the gateway to the Galapagos Islands, but this South American country has so much more to offer. Make your way to Baños and you’ll find a plethora of outdoor activities in addition to its eponymous hot springs. Situated on the northwest corner of the South American continent, Ecuador is a verdant jewel that beckons all types of travelers. But while many people merely pass through on their way to the Galapagos Islands, there are plenty of reasons to stay and explore. One of my favorite Ecuadorian destinations is the town of Baños de Agua Santa, better known as Baños. Nestled in the Andean Highlands, Baños is often referred as the “Gateway to the Amazon” due to its proximity to the Amazon Basin. It’s lush with a moderate temperature and is easily navigable, with less than 20,000 residents. However, its population swells with backpackers and tourists, hot springs soakers, and adventure seekers. For those who prefer a bit of adrenaline with their jungle journey, here are some of the outdoor adventures you have to try. I’m not a huge cyclist, but the Ruta de las Cascadas is worth it. Rent a bike from one of the many shops in town (don’t forget a helmet!) and follow the signs. This approximately 11.2 mile (18 kilometer) trail follows a series of impressive cascades—many of which you can see from the road to Rio Verde—and ends at the most spectacular waterfall of the route, the Pailon del Diablo (Devil’s Cauldron). Pay a small fee to walk to the waterfall and marvel at its majesty. 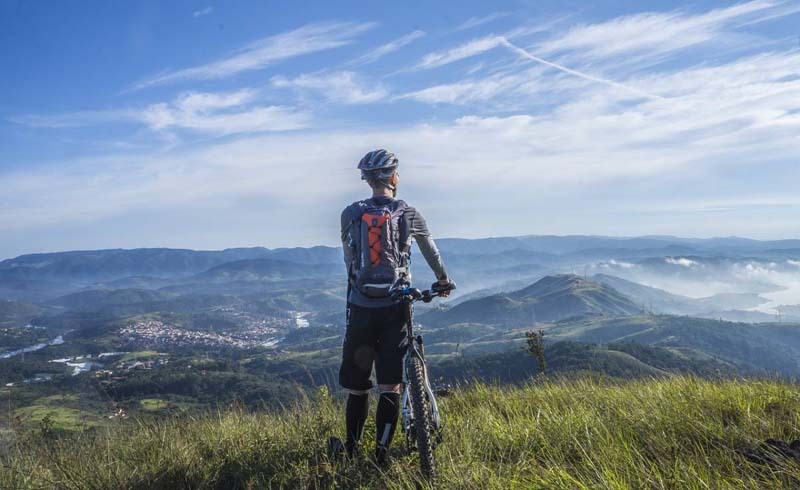 If you’re feeling toasty from your ride, there are plenty of vantage points that will ensure a drenching. And if you’re still feeling good, continue riding on to Puyo. Pro tip: Keep some cash on you in a discreet and lightweight money belt to cover bike rentals and park entrance fees. Sure, you may have been rock climbing before, but have you ever ascended on volcanic rock? Travel just a few minutes from Baños to Parque Aventura San Martín and you’ll get your chance. With the raging Rio Pastasa below you and the basalt cliffs of San Martín in front of you, there’s nothing quite like climbing here, reaching for handholds on a wall that was once bubbling below the earth’s surface. Combining climbing, rappelling, hiking, and sometimes sliding, canyoneering is one of the most popular adventures in Baños. Guides lead you about 10 minutes outside of town to Rio Blanco where you’ll don essential gear: a wetsuit, helmet, shoes, and a harness. After climbing to the top of a waterfall, you’ll then rappel down, which is more difficult than it sounds due to water rushing over you and the slippery rocks. However, it’s so much fun you won’t notice. But that’s not the end—there are usually several waterfalls to conquer on the adventure, plus some river sliding and possibly zip lining, if you’re lucky. It’s a whole gamut of experiences, rolled into one amazing day. Pro tip: If it sounds like this adventure will leave your clothes soaked, it’s because it will. Keep wet and dirty items separate from the rest of your clothing in a divided packing organizer. Sure, swinging doesn’t sound very adventurous—after all, kids on playgrounds do it all the time, right? But this swing is called “The Swing at the End of the World.” At the Casa del Arbol, you can get great views of Mt. 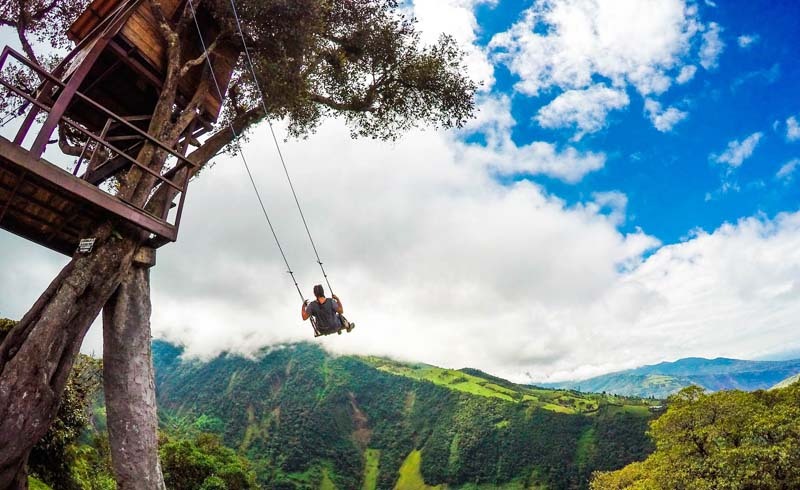 Tungurahua, the active volcano, but the real reason that people flock to this lofty perch? The swing hanging from a tree house. Pay a small “maintenance fee” and you, too, can experience the thrill of swinging into space. It’s almost impossible to visit Baños and not try some sort of adventure, no matter what your adrenaline threshold might be. Feeling motivated? It’s easy to pack several activities into a short period, canyoneering in the morning before conquering whitewater rafting in the afternoon and rock climbing the next morning. But no matter what you try, you’re almost certainly going to fall in love with this adventurous destination. Are you ready to make your plans to visit Ecuador? Check out this video for everything you need to pack for an adventurous trip .